What type of degrees or certification do you offer? 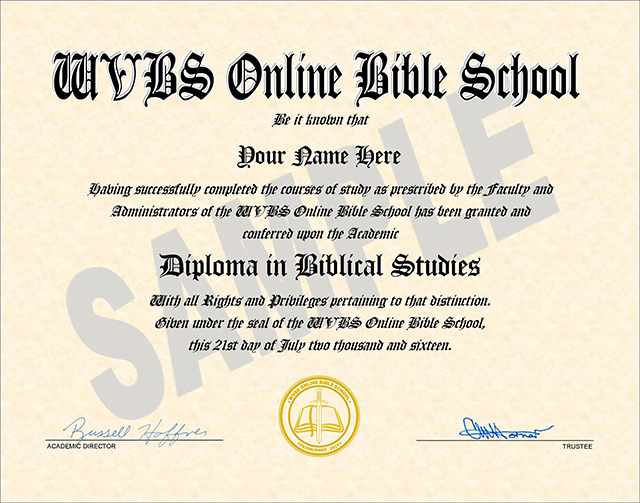 Is the WVBS Online Bible School accredited? 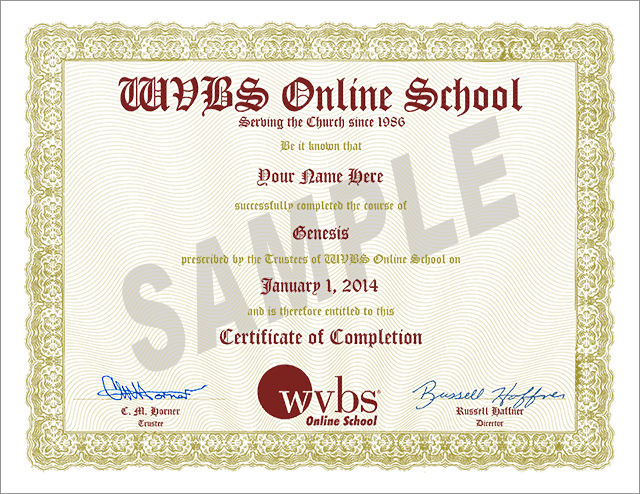 If you are a Formal or Informal student the WVBS Online Bible School issues a certificate of completion to you for each course you successfully complete. And, if you are a Formal student we issue a graduation diploma upon successfully completing all required courses. The WVBS Online Bible School has not sought accreditation through any accrediting association for several reasons. Some of which are: 1) they require additional courses other than Bible or Bible related courses such as English, science, physical education and other liberal arts courses in order to graduate; 2) the accrediting associations can only require or certify non-doctrinal (Bible) courses. They give as their reason that this keeps the “Separation of Church & State”; 3) the accrediting associations require certain standards and performance in financial matters which have nothing to do with any biblical standards. The level of work required by the WVBS Online Bible School is equal to and even superior to many degree granting seminaries and colleges. Any graduate of the WVBS Online Bible School will be fully qualified to teach the Bible even in accredited institutions according to the accrediting organizations. This is because they have no authority or jurisdiction over any church’s doctrine. If any college or university refuses to hire a person in their Bible department because of a lack of certain types of degrees that is that college’s or that university’s rule not any rule from the accrediting associations. No church or denomination owns or operates WVBS. All of the trustees and employees are faithful Christians who have come together to help anyone who wants to know more about God and His Bible. The WVBS Online Bible School is designed as an online-only education facility. There are no live classes or physical campuses to attend. The school is a self-paced, online correspondence school. The offices of the school are located in Maxwell, Texas, which is a town located near Austin, Texas USA. How may I help the School? One of the best ways you can help the school is by spreading the word. Tell others about your experience as a student of the school. You can share with them the benefits of the school and what you have learned from the instructors. You could show them the website, let them see the sample course videos, or even walk them through the enrolling process. Can women take these courses? Yes! These courses are open to any and all who would like to learn more about God and how to please Him. How do I obtain a printed copy of the Syllabus, Course Notes, and/or Textbooks? Auditing Students can access the syllabus for each course by selecting the “Syllabus” tab located on each course page. If a printed copy is desired there is a "Print" button located to the upper-right of the displayed document where personal copies can be printed. Formal and Informal Students not only have the same access to the syllabi but also the Course Notes and any required textbooks published by WVBS. Formal and Informal Students will notice on each course page tabs below the title thumbnail for course Description, Syllabus, Course Notes, Course Books and Exams. Click on the appropriate tab and the document will be displayed. These materials are provided free for online viewing to Formal and Informal Students only. If printed pages are desired, there is a “Print” button located to the upper-right of the displayed document. Those who are unable to print the documents, may purchase them from the WVBS online store. The Course Notes may be purchased as hard copies, e-notes or on a USB Flashdrive which has the Course Notes for all courses in the school (www.wvbs.org/index.php/course-notes.html). I am ready for my test! Please see the instructions on the How-to: Testing Process guide. How do I review my answers for an online graded exam? Once you have logged-in to your student account, you will need to select the "My Dashboard" tab located on the menu bar near the top of the page. Under the "My Course Progress" tab you will see a listing of your registered courses. Select the arrow next to the desired course to open the course progress. A list of any online exams taken for that course will be shown. Click the statistics icon, which looks like a notepad, for the exam you would like to review. You will be able to see your answers and the correct answers for ones you missed. How many courses are there in the school? There are a total of 45 courses. 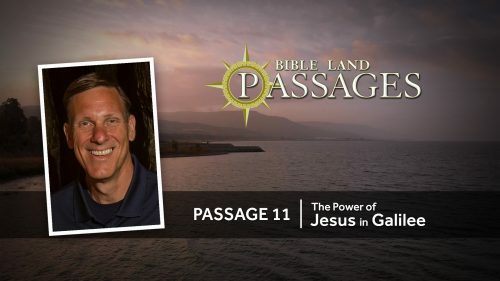 They cover every book of the Bible and a few courses that help you to understand the Bible better. Where is the order of courses Formal Students must follow? Formal Students must complete their coursework in the order shown on the Course Schedule. While Informal Students are not required to follow this order, it is the recommended sequence for best comprehension. Do I have to purchase the DVDs? No! However, if you are not able to go online to view the courses, or you simply want to have the DVDs, you may purchase the DVDs from the online store: www.wvbs.org. Is there a discount for the course DVDs? If you are an active “Formal” or “Informal” student in good standing and are not able to go online to view the courses, or you simply want to have the DVDs, you may purchase the DVDs at half of the web store price (online store: www.wvbs.org). This is for “Formal” or “Informal” students only. The notebooks are not discounted because of the cost of postage and production. There is also no discount on videos and books not used in the school. To receive a discount we must verify your student number, which will be assigned to you upon acceptance of your application. For phone orders please provide us with your student number, or for online orders please enter your student number in the "Company" field of your billing address. Thank you for your interest in our material. Yes, you may, but we recommend you take no more than 2 or 3 courses at one time. We do not want the students to become overwhelmed with new information. If you are a Formal or Informal student please complete one course in its entirety before starting additional courses. In this way you can benefit by having graded material to refer to as you work on your assignments for future classes. What is the allotted time for each course? All courses are studied "at-your-own-pace" and do not have any official start time, end time or duration. We do want the students to be encouraged to complete their courses, so please Contact Us if you feel like your progress has stalled. How many times can I possibly go online to study the lessons? There are no limits on how many times you can access the courses as you view and study them. I am an “informal” student. Can I switch to “formal” status later? You can change your status any time you desire if your circumstances change and you wish to alter your method of study. On the exams you will find a "Knowing the Text" section which will supply a set of Bible verses with certain words left out. The students will be required to fill-in-the-blanks to complete the verses. For purposes of textual accuracy and uniformity all "Knowing the Text" sections on the exams are to be done using one of the following versions. No Bible translation is perfect, but these versions have earned a reputation for reliability. Although there are other good versions you can use in your studies only the four listed are admissible for the "Knowing the Text" portion of the exams. King James Version (KJV) by Public Domain. New King James Version(NKJV) Scripture taken from the New King James Version®. Copyright © 1982 by Thomas Nelson. Used by permission. All rights reserved. New American Standard Bible (NASB) Copyright © 1960, 1962, 1963, 1968, 1971, 1972, 1973, 1975, 1977, 1995 by The Lockman Foundation. Receiving "Error 404 - Page Not Found"
From this page perform a Hard Reload by pressing the "Ctrl" and "F5" keys together, or on Mac the "Command" + "Shift" + "R" keys together. Now, you should be able to proceed with your studies. If step 1 above does not work, then you can try an alternate method to clear the browser's cache. In the Google Chrome browser you can press the "F12" key, then click and hold on the refresh icon (on the left-side of the address bar) and from the drop-down menu choose the "Empty cache and Hard Reload" option. Be sure to verify that you are using your correct username or email address for your account. If you cannot remember your username, then you can click the "Lost Password" link below the login form and enter your email address. An email will be sent to you with the username you chose and a link if you want to reset your password. If you remember your username but have forgotten your password, then please click the "Lost Password" link below the login form and follow the directions in the email that will be sent in order to reset your password. After creating your free account, your student status is set to "Auditing" student. You may start your studies immediately, and any lessons you "Mark Complete" will be saved to your account. If you applied to be a “Formal” or “Informal” student you will receive an email notification of acceptance, please allow 5 to 10 working days.